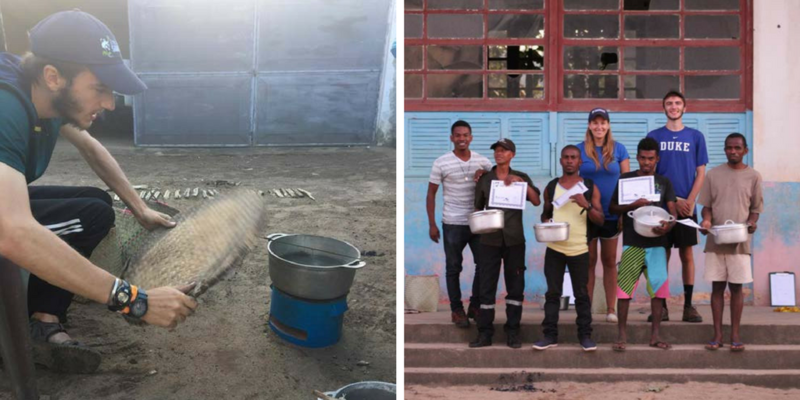 Four students were part of the Bass Connections Cookstoves and Air Pollution in Madagascar: Finding Winning Solutions for Human Health and Biodiversity team, which investigated the consequences of traditional cooking practices. Erin Litzow is a 2017 Master of Environmental Management graduate; Lydia Greene is a Ph.D. candidate in Ecology; Laura Guidera (‘18) is a Biology major; and Thomas Klug (’18) is double-majoring in Public Policy and Environmental Sciences. In the summer of 2017, Klug extended his Bass Connections research on the impacts of traditional biomass cooking in Madagascar through a DukeEngage independent project.